Will the demand for Appliance Repair Techs increase in the near future? The short answer is "yes!" according to the Bureau of Labor. We discussed their projection that the demand for appliance repair technicians will grow by 21% over the next decade in an earlier Blog Post. It's an important question for anyone looking to invest time and money in training. You want to make sure there's a good chance of getting a job or running your own business once you've geared up. Besides the overall growth trend that the BoL is predicting, we also think there will be another important shift in the trade due to the changes in appliances happening right now. Due to a number of factors, especially the government Energy Star requirements, appliances are becoming increasingly "electronified." We think the increasing computerization and complexity of appliances will only create more opportunities for skilled technicians to have a steady work flow with lots of interesting and profitable work. This will weed out the people who don't want to learn new technologies and change with the times from the people who do keep up with technology and continue to learn and hone their skills. That second group of techs will find that they have plenty of work. It was recognizing this trend, along with noting the lack of convenient training available in these critical skills, that inspired us to create the Samurai Tech Academy. 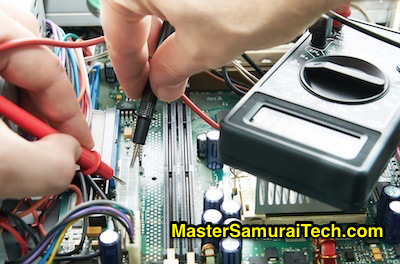 The Fundamentals of Appliance Repair course at the Samurai Tech Academy provides an excellent technical foundation giving you the basic skills you need to build on and understand the present and future technologies coming out in appliances, and how to profit from that knowledge. Then take the Advanced Schematic Analysis and Troubleshooting training course to get advanced instruction on troubleshooting appliances with multiple electronic control boards.